Patient will be walking with crutches non-weightbearing until most of the swelling resolves. Patient may be in a removable boot after surgery for a week or two at the direction of the physician. Limit unnecessary walking or standing for the first week to control swelling and pain. Ice ankle/foot 3-5 times (15 minutes each time) per day to control swelling and inflammation. Elevate leg above the heart as much as possible to control swelling and inflammation. No impact or cutting exercises/activities for 6 weeks post-op. M.D. follow-up visits at Day 1, Day 8-10, Month 1, Month 6 and Year 1 post-op. M.D. visit at day 1 post-op to change dressing and review home program. Start gentle ankle active range of motion immediately post-op. M.D. visit at day 8-10 for suture removal and check-up. Gait training with crutches to minimize compensations and to reinforce weightbearing status on the surgical leg as necessary. Progress to weightbearing as tolerated with assistive device as needed guided by pain and swelling and the physical therapist. Follow-up x-ray at week 4-6 to monitor healing. Soft tissue treatments for swelling, mobility and healing. Exercises: Bike, core exercises, balance activities when indicated. Foot and ankle stretching and theraband exercises to regain full ROM and strength. Increase functional weight bearing exercises and activities. Avoid jumping and rapid changes in direction. 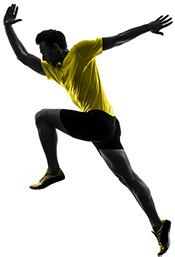 Continue with foot and ankle joint mobilizations. Increase the intensity of strength, balance, coordination and functional training for gradual return to activities and sports.